This post shows you the postcard-pretty Palma de Mallorca old town that hides behind the famous cathedral. El Casco Antiguo has been there for hundreds of years before any tourists came to the island. People live their life in narrow cobbled streets like they always did. Palma de Mallorca old town is the real Mallorca that you shouldn’t miss when visiting the island. The Bay of Palma on both sides of Mallorca’s old capital is one of Europe’s biggest holiday resorts. All holiday makers land in Palma but most of them skip the city and head straight off to the beaches. Because they don’t know what Palma is like: it’s a different world. It’s a living local city and it has unique architecture. I made a walking itinerary that shows you Palma de Mallorca old town. It’s a half day walk and takes you to old Arab and Jewish quarters, beautiful squares and churches, all packed in an area of a square kilometer. Walking is the way to see Palma de Mallorca old town. The streets are narrow and most streets are pedestrianized. There’s no place to park. We left our car in the parking garage Paseo Maritimo that you can see on my Palma map. It’s almost below the cathedral and very easy to find. Parking in itself took almost an hour which made me think we should have in fact taken a bus. Palma is an old Moorish city and the cathedral was built where the main mosque stood (and before that a Roman temple). It was a huge effort to build the cathedral. They kept building for five hundred years from 1230 on. And then came an earthquake and again they built. Go in the cathedral if you can. The interior is stunning. Gaudi planned parts of it as he helped rebuild the church after earthquake. You can tell Mallorca’s cathedral and the one in Barcelona, Sagrada Familia, are planned by the same man. So now we have seen the cathedral but what else is there to see? Just like the name says the Palace of Almudaina has been a Moorish fortress. Almudaina is the Arabic for fortress. When the Spanish took over in the 13th century they made the Moorish fortress their royal residence. Still today the Spanish king uses Almudaina when he is ruling from Mallorca. The history of the Palace of Almudaina gave it a mixture of styles, Moorish and Gothic. Many parts of the palace are open to the public depending on if the king is there. There is the queen’s office, the kings room’s, a courtyard garden, Arab baths and so on. Palma has a lot of the old city wall left and it’s well preserved. Even some old gates are left. But the scenery from the wall is modern towards the sea. I so much like walking along the old Palma wall. Below is Parc de La Mar. It’s a modern walking area with many levels and a man made lake. It was Joan Miro who planned all this in the 1960s when he lived in Mallorca. There is a Joan Miro museum a short way from Palma, in Cala Mayor. Behind the cathedral are Palma’s old Arab quarters and the ancient Moorish baths Banys Arabs. The baths are a peaceful corner of Palma de Mallorca old town. They are in a private garden. And the original Moorish hammam still stands there. Twelve columns support its roof that has a hole to bring in light. The same idea was used in Pantheon in a larger scale. Close to Banys Arabs is the Museu de Mallorca. It has a good exhibition of Mallorcan art, paintings, ceramics, stone fragments and so on – the right place to learn about Mallorca’s history. So Palma de Mallorca old town begins right behind the cathedral. My photos show what old town alleys looks like. There are a lot of these lanes spread on a large area. Palma consists of many historical layers which you can tell from the buildings. Palma originally was the Roman city of Palmaria (from 120 BC on) and Roman ruins still exist one or two meters below the ground. Then between 902 and 1229 it was a Moorish city. We already saw some of those remains. And since that Palma is a Spanish city with its own culture. It’s clearly a Catalan city affected by Catalan architecture. And there have been even more influencers: the Jewish. Palma de Mallorca old town had one of the leading Jewish communities in Europe. Palma does not only have the cathedral. Almost every square in the old town has a church, a small invisible one or a big one like these two. This is Basilica de Sant Francesc and it took a hundred years to build it. But it was worth the effort, look what rosette they carved in the facade! And the next square Placa Santa Eulalia shows a different style, there is a Gothic church. The next old town square is Placa de Cort. Placa de Cort is triangle shaped and has Palma Town Hall on one side. The huge olive tree on the square is 800 years old. It provides much wanted shade to locals and tourists in outdoor tapas bars that there is a good choice of. Palma de Mallorca old town is not only old layers, there are new things as well. Or what do you say about this modernist building? It is Can Forteza Rey on Placa del Marques del Palmer, also called Can Rei. It’s an apartment building designed by Luis Forteza Rey. The style is called Catalonian art nouveau. Gaudi was a leader in this style and he lived in Palma while helping rebuild the cathedral. Thanks to him Palma got a lot of buildings with this kind of new, fresh look. 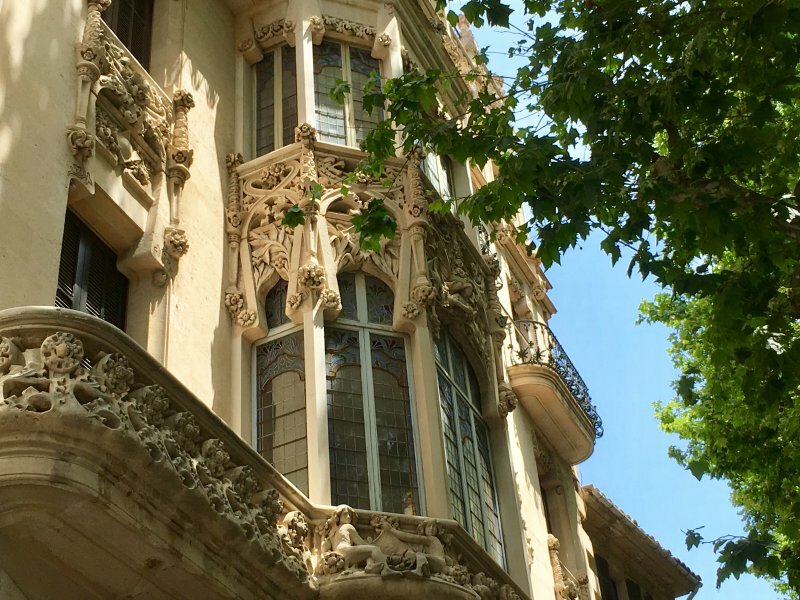 Arte modernista architects used the kind of forms and details that Gaudi used in his works: broken ceramic tiles, glass paintings and wrought iron balconies. Next door to Can Rei is one of Palma’s main squares Placa Major. The 19th century square has massive yellow buildings on all sides and cafes and street stalls in the middle. And Placa Major is always packed with people. Since this is the core of Palma de Mallorca’s shopping area. And all these people hanging out here are right. Placa Major is a beautiful square, and not least for the balconies and green window shutters. IT’s easy to see why Placa Major is on the UNESCO World Heritage list. Avinguda Jaume III has a lot of big plane trees that provide much needed shade. Summer days in Mallorca are hot. This is not pedestrian zone and there’s a lot of noisy traffic passing, yet people sit and spend their time in pavement cafes. But these are not just any cafes. The Forn d’es Teatre is Palma de Mallorca’s famous theatre pastry shop (the theatre itself is nearby). And the stylish Bar Central is another popular meeting place. A view from the cafes: one of Palma’s greatest buildings, Fundacio La Caixa. Caixa originally was a hotel, the Grand Hotel. That was the first luxury hotel built in Palma when tourism to Mallorca started. That was in 1902. Since then travel has increased and the branch changed a lot. The Grand Hotel left the building and the local bank Fundacio de Caixa financed restoring it. Today Fundacio de Caixa contains art exhibitions, a bookshop and a cultural center. And a street cafe. More modernist buildings follow down the street, the twin houses Can Casayas. They are from 1908. The twin houses too are perfectly restored. They have so many crooked lines and unusual details that I have to sit down and just look. The location is Placa del Mercat. Back from the narrow shopping lanes: Passeig des Born, the center of another shopping district. The shady Passeig des Born is an elegant avenue lined with brand shops. It has a wide walking area in the middle: cafes, street sellers, fountains and a lot of stone benches to sit on. It looks a bit like the Rambla in Barcelona. Passeig des Born is where you will probably start exploring Palma if you arrive by bus. It is the very center of Palma and the avenue leads to Placa de la Reina in the south. And the shady avenue continues, all the way back to the car park where we started. Avinguda Antoni originally was a fortress moat and there still is some water. And an old gate and fountains and statues. I like this shady place – but it will soon be time to head back to my hotel pool outside Palma. the best with tourism is that you can have both the culture and the beach life. This has been a wonderful day and we have walked pretty much. And we have seen a lot of the postcard-pretty Palma de Mallorca old town that hides behind the cathedral. Each time I go to Palma it surprises me, once again. The city is so atmospheric and they have preserved so much of the old. Hope you liked my Palma walk and hope my post was helpful. There’s so much to see everywhere we go, you just have to find the right places. Was there something I missed that should have been included in the itinerary? Certainly a lot but I can’t write more in one post. You can add it in the comments.